Barely resisting the temptation to continue further into Guatemala, early the following morning we started a long journey to the Belize coast. Our goal, Caye Caulker. Catching a ride back to the Ixlu highway junction, we quickly flagged a passing local minibus to take us back to the border where we once again walked across and jumped on a bus direct to Belize city. Though somewhat less intimidated in the daylight, we were still not impressed with the look of the nation's largest city and opted to take a taxi across town to the ferry terminal where after a brief wait we were loaded aboard a sleek, half-covered water rocket for a bumpy ride to Caye Caulker. Belize is a Central American anomaly having been a British colony rather than a Spanish one and in many ways is more influenced by Caribbean culture than anything else. The country is small, with a population of only around 350,000 most of which are English-speaking. It doesn't feel busy or densely populated, so driving would not be too difficult though it wasn't very hard to get around on the buses either. They are old school buses thus slow and severely lacking in luxury but cheap and reliable. We found it amusing to attempt to eavesdrop on the local conversations around us. We could understand 50% of their patois, though when they spoke to us it was always in a more standard English. In any case, much easier than Spanish! Towns and villages were small and laid-back and it didn't surprise us to see so many signs of Canadian retirees and expats hanging out in Belize either. 10hrs after departing Tikal, we stumbled off our boat feeling more that a little ready for some relaxing time by the water. The coast is by far the most popular and famous part of Belize and for good reason. Off the coast of Belize and stretching north along the Yucatan peninsula is the world's 2nd largest barrier reef. There are numerous sandy islands off the coast, several of which are inhabited and Caye Caulker is the 2nd most popular one for tourists to visit. 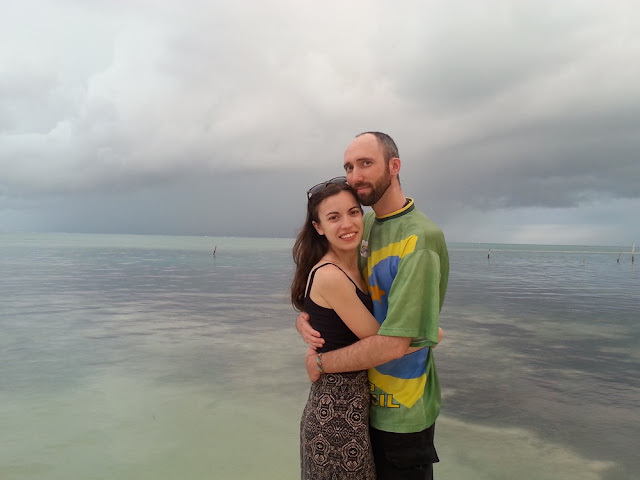 It is considered the more budget "backpacker" island in contrast with the larger and more developed Ambergris Caye to the north so naturally we gravitated toward Caye Caulker. Caye Caulker is only a couple km long and never more than three sandy streets wide, so it was easy to walk everywhere. In fact, the only other transport options were bicycles and golf carts. The main waterfront street is lined with little restaurants whose main draw is cheap lobster set menus, or little tour offices selling mostly diving and snorkelling tours. It is more of a relaxing, easy-going destination than a partying one with quite a few Rasta touts and no large groups. We were in Caulker for three nights and had a relaxing time though never found anywhere that could truly be called a beach and we had quite a bit of rain off and on. Mom and I went scuba diving for the first time in years and survived. 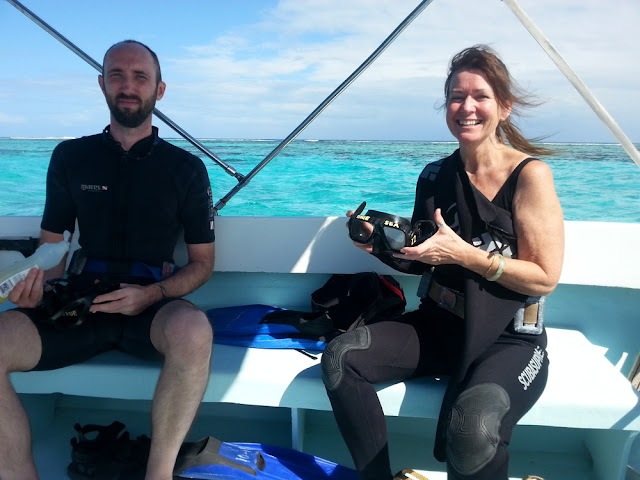 It having been so long we opted to just dive on a local reef and not pay the big bucks and take the long ride out to somewhere more exotic. The most famous dive site in Belize is the Blue Hole, but it is a 2hr ride away and $$$. Maybe another time for that one. Sasha rode out with us in the boat and during our surface interval we were able to stop at one of the popular snorkeling sites and snorkel around with a bunch of sharks and rays in 4ft of water. This initially looks as scary as it sounds! How do you build up enough courage to get in? Let mom go first of course! She really is fearless and jumped in without a second thought. I'm happy to report that all limbs and digits returned to the boat safely. We left Caulker on the first boat back to Belize city, caught the next bus back to Chetumal, Mexico and then a bus from there direct to Valladolid. We weren't even sure if such a route was possible in one day but we got lucky with our connections (when in doubt start as early in the morning as possible to increase the odds of success) and despite delays on the final ride, rolled into Valladolid just after sunset. In all, another 12hr transit day. Depending on the day, there is a more expensive though somewhat faster scheduled speed boat/ferry from Ambergris Caye to Chetumal with boats connecting from Caulker but personally I try to avoid long boat rides when I can. Valladolid was a strategic destination and, ignorant foreigners that we are, we erroneously had low expectations for the town. As it turns out, it was pretty, cheap and hassle-free. We didn't see much as we were only there for 2 nights and 1 day and that one day was spent at the nearby ruins of Chichen-Itza. Chichen-Itza = Disneyland. A victim of its own popularity and proximity to the Cancun area tourist zone, you still have to see it once so that means doing it strategically. Most visitors are on day trips from the coast in and around Cancun. It takes a couple hours on a tour bus to get there and the ruins get very busy starting from late morning. Leaving on an early bus from Valladolid, we were able to get there at 9am and for the first half of our visit we were easily able to get photos without hordes of people in the background and walk about without touts hassling us (even they were still arriving and setting up). 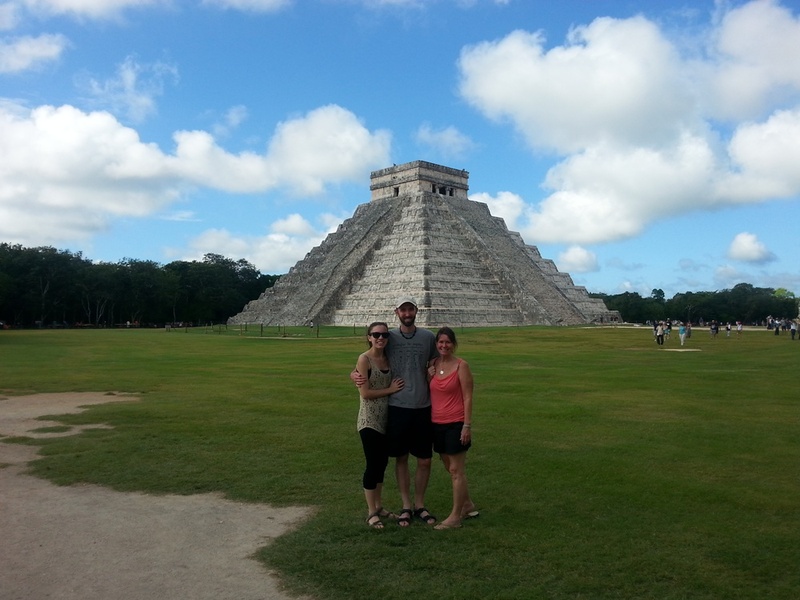 There is more to Chichen-Itza than the famous temple that everyone has seen photos of. The architectural style is quite different from that of Tikal too, having not only Mayan influences but also Toltec and Puuc. These guys seemed like a more violent bunch with more carvings and decoration showing battles and skulls. There is lots to see and walking around to do but it is all very organized and unfortunately roped off so you can't actually touch or climb on anything anymore. Not that any of it would last if everyone did. Like I said, victim of it's popularity. We enjoyed the 4 hours that we spent there and as we left the parking lot was full with tour buses in a traffic jam to drop even more people off. Yikes! Back in Valladolid we explored the town, saw a fortified convent, nice plazas and even visited a little chocolate museum. Cacao beans/seeds were used as a currency by the Mayans and the word comes from the Mayan choco haa. Cool. 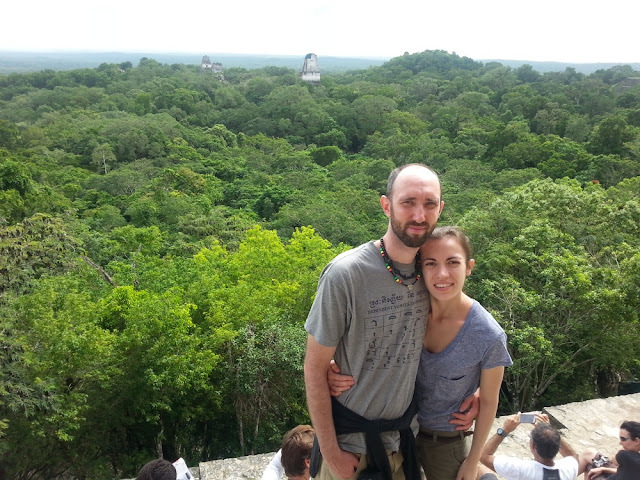 The following morning we caught an early bus to Coba where we stayed a night and visited its less popular ruins. The interesting thing about Coba is that it is less developed and excavated and there are dirt paths leading out to the various sites. The most popular way to see them is to rent a bicycle on site and ride around. We did this and it didn't take long to get around everywhere including to the furthest temple a couple km away which you can climb. It doesn't look that bad from the bottom but once you get started on the nearly vertical steps, you can appreciate the rope they've added to help you climb. More than a few people at the top expressed dismay at the thought of the return trip down. The view from the top was the top of the jungle canopy and not much else, which was a nice contrast to the day before. The village is tiny with minimal accommodation or food options and it would make more sense to visit Coba as a day trip if we had to do it again. 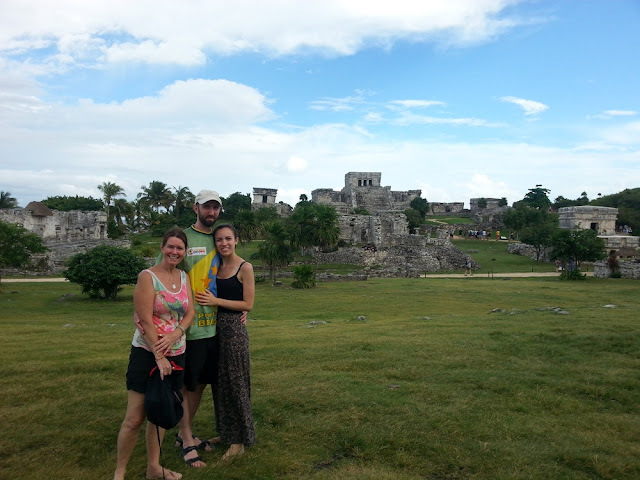 From Coba we continued to Tulum. Tulum is nice though it feels more like a generic coastal tourist town than somewhere in Mexico. It is rapidly growing and popular with tourists, both those staying in the area and for day-trippers from further up the coast. It has all the standard services and attractions just on a slightly smaller scale. The unique attraction of Tulum is its coastal ruins. The setting is actually spectacular with the ruins overlooking stunning blue water and beaches. We walked the 3km from town and then lazily took in the ruins. Like Chichen-Itza it had an open layout with green lawn separating the ruins and you couldn't touch most of what was there to be seen, but the view made just about anything forgivable. If you have any kind of phobia of iguanas you might want to rethink a visit though because there are literally hundreds lazing about on the grass and ruins. The next day we hung out on the beach with its powdery white sand and clear water and did some final shopping before our flight home the day after. In all a success and an area worth visiting again to explore further. Our "last" day was on a bus that went directly to the Cancun airport with a stop in Playa del Carmen. We said bye to mom and got settled in on the plane for our first leg to Montreal. At 2pm we taxied out and stopped for a while. At 6pm they finally let us off the plane and admitted it was going to take a while to fix. The departure forecast got progressively worse and rumours flew but they flew first in French so we were one of the last in line by the time they started processing us to get back into Cancun to a hotel for the night and try again the next day. At 10pm we were finally checked into a 4-star all-inclusive hotel. While checking in the told us that if we ran fast we could still get into dinner.....and we ran! And feasted our worries away :) So yes, been there, done that whole all-inclusive thing in Cancun now, haha. The next day we were able to leave, a full day late. Good thing our schedules are flexible, just like our travel. November 2015. Newly-licensed controller Ammon and long-suffering (training is hard on the spouse) sidekick Sasha prepare to embark on their first significant overseas trip together. It was to be their first multi-stop, non-resort holiday, lasting a grand total of 16 days. Nerves from Ammon, excitement from Sasha. Sasha was to finally get a taste of "backpacking", Ammon, a chance to dust off the rusty skills and get adventurous again after a 3-year hiatus. The inspiration: A nearly similarly routed trip by Bre and Donovan 2 years prior. Guidebook borrowed from the library? Check. Just one thing missing......recruit backup. What more could a well-adjusted, mature man do but call his mother and invite her to partake in the madness again in times like these? She had, after all, survived everything before. The first difficulty was encountered immediately after exiting Cancun airport on arrival. Mom, arriving an hour earlier from Amsterdam in a different terminal was nowhere to be seen, and there was no wifi to coordinate. And then Mom, like the shining saviour she was recruited to be, strides into the terminal to rescue the two bewildered travellers who were in the process of being devoured by time-share touts. Quickly fleeing to the sanctuary of an air-conditioned bus direct to Playa del Carmen, the three spent the first night in the company of a friend of Sasha's who had been visiting there at the time. Numerous small hotels, beachfront restaurants, a pedestrianized-waterfront street, brand name shopping. Tourist paradise on Earth? Three differing opinions were voiced on this very topic, but no consensus was reached for early the next morning they would depart, further from development and closer to adventure. Aircon coach bus from Playa del Carmen south to Chetumal on smooth roads, past resort and theme park entrances and views of thick green bush alongside the highway. Brief confusion during a 10 minute walk from the bus station to a small market with buses departing for Belize city. Bump, bump, rattle, rattle, stop for passengers randomly and often. This, Ammon remembers. Back pain, uncomfortable seats. This, Mom remembers. Children in school uniforms and small settlements outside the window. This, Sasha will remember. Darkness in Belize city at the bus station is less than ideal. It's small, little more than a parking lot, a couple little convenience food and supply stands and dark, undeveloped roads around. No ATM, no major signs of life but plenty of factors suggesting it was best to continue moving on. So onward they continued. 12hrs of buses and transfers before stumbling off the bus and into the waiting arms of the quiet town of San Ignacio, Belize. 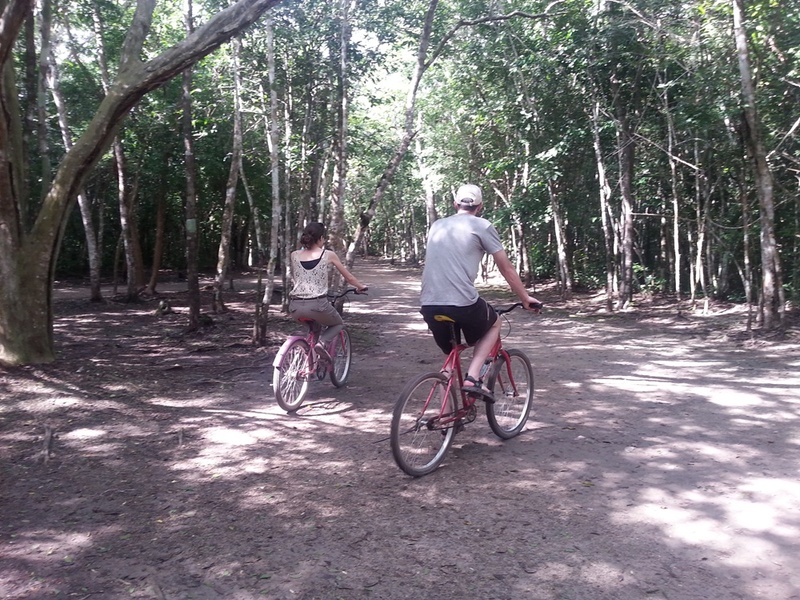 San Ignacio, like all things in Belize, is small, quiet and easily manageable. It makes an excellent base for exploring the western portion of the country and caters well to foreign visitors with nice little restaurants, a good selection of accommodation, banks, tour agencies, transportation and sites to visit. Popular destinations from San Ignacio include cave tours, hill stations and a variety of Mayan ruins. Using San Ignacio as a base for the following three days our protagonists made excursions to the mayan ruins of Xunatunich and Cahal Pech as well as the Belize Zoo. Xunatunich is an old Mayan centre of significant size and well preserved and makes a nice introduction to Mayan ruins without the crowds and chaos of the more famous locations. It has a more open and manicured feel. Cahal Pech is on a hill above San Ignacio a 20 minute walk away and was surprisingly deserted, allowing an adventurous scramble amongst the more moss-covered and atmospheric ruins. Beware of wicked Mayan spirits, who were surely behind Sasha's falling and earning her first lumps. 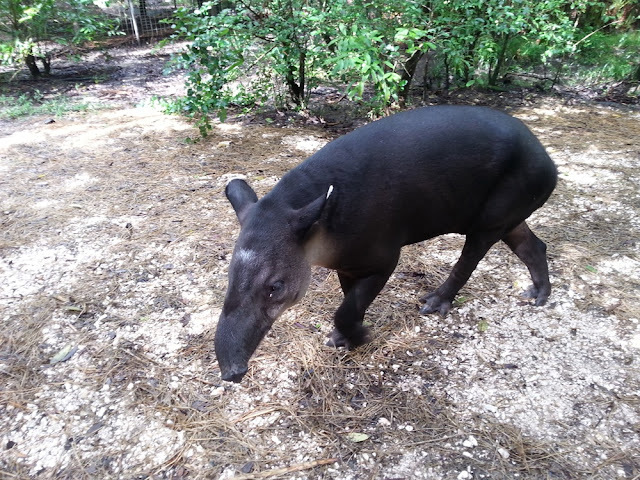 The Belize Zoo is something special. It is more of an animal rehabilitation and wildlife education centre and is quite small, but contains only local species. The setting feels like walking in the jungle and is very intimate with well kept animals in well thought out pens yet still easily viewed and admired. 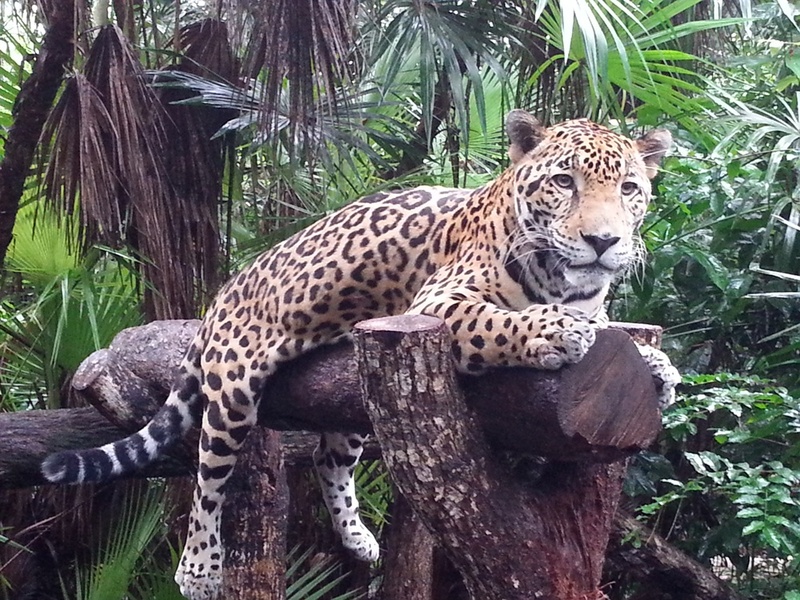 Jaguars, howler and spider monkeys, toucans, tapir, crocodiles, harpy eagles and macaws all made their presence known. Crowds were small and despite a downpour on departure, it remains a highlight of the trip. Tikal. Mighty Tikal. Once a major Mayan city the 1300 year old ruins are worthy of inclusion on the list of great world ruins. In the far northeast of Guatemala, there are three main strategies for a visit. 1. A long and exhausting day trip as a tour from San Ignacio. Terrible idea. 2. A long day trip/tour from Flores, Guatemala. The most common strategy, perhaps best for those in a hurry or on a budget but without actually saving much budget or time. 3. 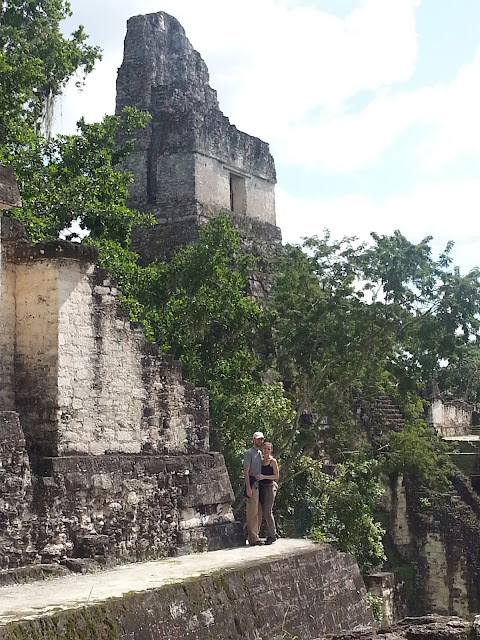 Stay in Tikal overnight in the little village of three hotels and a couple tourist shops just outside the ruins. There are budget options, there are nice options, there is way more atmosphere. In his infinite wisdom Ammon chose to take a chance on option #3. From San Ignacio, a bus, a walk across a border (~2km, not altogether appreciated by his sweating sidekicks), another bus, a wait at a highway junction. The girls glow from the heat, Ammon sweats for lack of public transit going the right direction and a plan only half formed in his head. Within 45 minutes a tour bus stops to pick up our stranded travelers. It is a group of backpackers taking option #2. 1. We would rather not be with a tour. 2. Pretty much everyone can speak better Spanish than us. 3. The entrance to the Tikal archaeological area (where you buy your ticket) is a 20 minute drive from the ruins. 4. We were ahead of schedule but our new and improved plan was still going to work. Unbeknownst to many visitors to Tikal, if you enter the site and buy a standard entry ticket after 3:30pm, the ticket is valid for the following day. So thanking the tour group, we bailed out at the entrance gate and waited 2hrs until 3:30pm to buy tickets along with about half a dozen other independent travellers that had also somehow made their way to the gate on their own. The ticket office started selling next-day tickets (cash only) at the appointed time and, like a carefully orchestrated dance, an old beat up little school bus (the last of the day) full of local Guatemalans pulls up to squeeze all the strategic travelers in. Quickly checking into the very adequate budget rooms at the appropriately named Jungle Lodge, Sasha admires the view of the jungle canopy and monkeys swinging in the trees, Ammon, in well-concealed terror searches for man-eating spiders lurking under the bed... Satisfied as to the immediate survivability of the situation, the three excited visitors quickly walk into the ruins complex for a teaser of what's to come the following day in the final hour of daylight available. There are night tickets and tours of the ruins available as well as sunrise options but they were deemed too risky with rain in the forecast. The following day, packing snacks and drinks for a full expedition, our well-rested and energized heroes channelled their inner Indiana Jones and set out to explore. 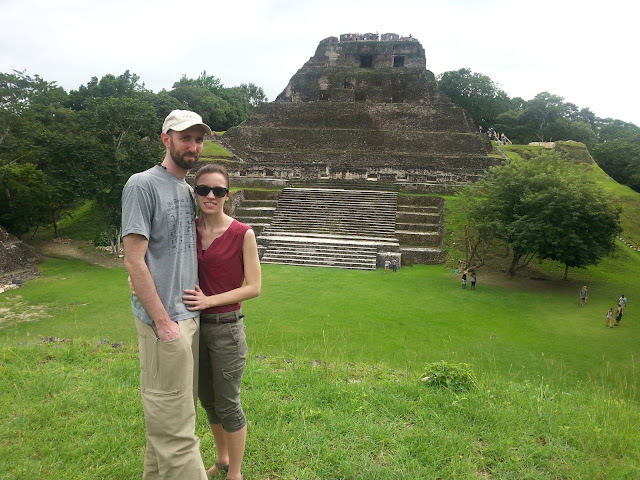 Unlike most other popular tourist attractions, Tikal still retains a very wild and undeveloped feel. It is a walk through the jungle to find some ruins without the manicured lawns, information signs and concrete pathways you'd typically expect to see. Roots, mud and wildlife are very much part of the experience. 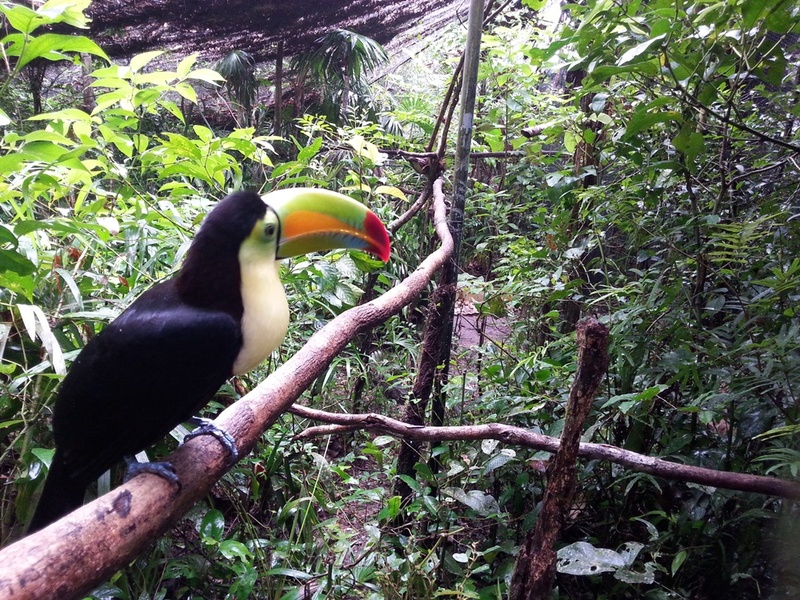 Monkeys, parrots, coatimundi, frogs and bugs abound. The central ruined temples are very popular but few people have the time or energy to walk out to the lesser known and more distant ones that can be as much as a 20 minute walk from each other. It is also possible to climb to the upper levels of some of the larger temples, from which you can catch a glimpse of the other tops rising above a solid mass of treetops stretching as far as the eye can see. The feeling of sitting on top of an ancient ruin listening to troops of howler monkeys roaring at each other in the distant trees below? In a word, Chills. Eerie. Wild. Or perhaps just Scary. It sounds like hungry unseen dinosaurs waiting to rip you to shreds the minute you descend. Risking life and limb the adrenalized explorers climbed and crawled and wandered. Poking a head in here, scrambling over stones there, they soared in the bliss of discovery. 7.5hrs later, exhausted but triumphant, confident in having covered every trail in search of all there was on offer, they wearily stumbled back to their jungle abode to gaze contentedly at the jungle mass from the relative safety of a fine dining room. That night they drifted into the perfect slumber of the content.